2.4.7 The racket covering shall be used without any physical, chemical or other treatment that may be considered harmful or unhealthy for the persons. Rationale: 1. It is impossible to control boosters with the current equipment/procedures, so the actual rule cannot be enforced. 2. The main problem of the harmful substances in the way rubbers were collated to blades was mitigated with the introduction of the VOC controls. I think this is a good idea, since (as I've blogged before), most top players are already boosting. (See more on this in my proposal below.) Making a rule that can't be enforced is silly as it simply penalizes those who refuse to join others in cheating, while forcing all players to face the reality that if they don't also cheat, they can't compete equally. (The same argument goes for hidden serves.) I've made my own proposal on this, the Racket Testing Rule Proposal. Tim Boggan and I have done eight chapters and 116 pages, plus the covers, of the planned 30 chapters and 460 pages. However, there's a catch - we haven't been putting in all the captions and photo credits as we zipped along, saving those for later. We're planning to go back and put them this morning, which will probably take at least a couple of hours. Most of the scanning was done in advance by Mal Anderson, who also supplied most of the photos. Tim is old school, and I mean very old school - his method is to take a pair of scissors and cut up all the old magazines - USATT Magazine, ITTF magazines, tournament programs, etc. - and put them together intricately so that they fit neatly on 8.5x11 pages. Then Mal scans them, and sends them to me on disk. However, this method means every page is full of scissors marks (which show up on the scans), and countless blemishes. Add that most of the pictures come from newsprint, which need a lot of work to fix up, and then adding all the captions and photo credits, and you can see why it takes 10-12 working days to get done. Oh, and did I mention that Tim constantly changes his plans for each page? Changing what's on a page is easy with modern layout technology, but trying doing it where you combine cutting and pasting old articles and Tiff scans! It often means I'm zooming in and highlighting a few lines or a paragraph to move to another part of the page, as well as regular changes to the pictures. "Tim, this is History of U.S. Table Tennis, not History of Everyone Who's Ever Touched a Ping-Pong Paddle Deserves His Picture in the Book!" After a discussion of whether Tim would go to the U.S. Nationals, I told him, "We can't run a Nationals without you!" Then I asked him, "Tim, have you ever been to a Nationals where they decided to hold it if you weren't there?" Here's the ITTF article. "Winner of the Boys’ Singles title at the 2017 ITTF World Junior Circuit Finals, staged in early February in Luxembourg, Kanak Jha of the United States is the new name at the top of the Under 18 Boys’ World Rankings." Here's the ITTF article. "Unblemished records, not a single individual game surrendered, Brazil and Chile, the top two seeds in the Women’s Team event at the 2018 Latin American Senior Championships the Cuban capital city of Havana, duly completed their initial stage group contests unbeaten on the opening day of play, Sunday 4th March." Here’s chapter 18 of Tim Boggan’s latest volume, which covers 1993-1994. Or you can buy it and previous volumes at www.timboggantabletennis.com. Chapter 18 is titled, "Jan/Feb 1994." Player Kicks Table and Gets Disqualified at 16-17 in Fifth! Here's the video (3:17) of Qian Wan and Sarah Mantz, starting at 13-12. The 16-16 points starts at 2:57, and ends with the kick and disqualification. Here's the graphic - and if you are in England, you can buy a tank top with it! 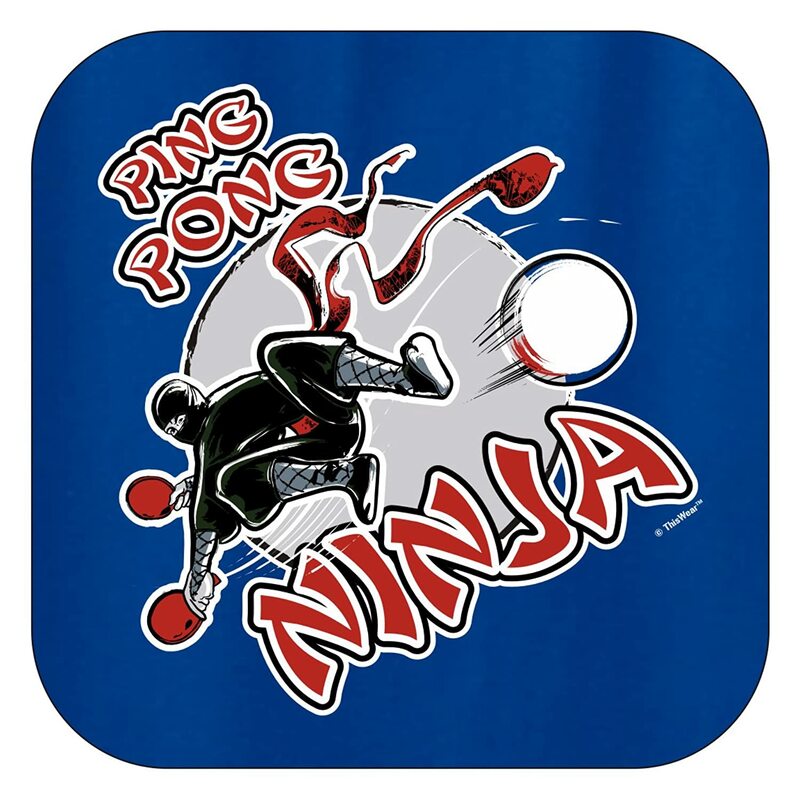 But here is Ping Pong Ninja clothing you can get at Amazon.